Before joining the Business Department in IT Tralee, Gerry served 17 years in the Irish Army as an infantry officer, both in operational units and Army Headquarters. He also specialised as a military deep-sea diver and was a senior instructor in the Army Diving Group. He was on active service with the United Nations Force in Lebanon in the 1980s and ‘90s. Gerry left the Army in 1998 with the rank of captain, and began a new career in academia. The move from the Army to lecturing in business was perhaps no great surprise. Gerry’s primary degree is a B.Sc. in Management from Trinity College. In addition, Gerry holds post-graduate qualifications in marketing and also in accounting and finance, and he obtained a first-class honours Master of Business in the Smurfit School in UCD, where he also got first place. More recently, Gerry was awarded a Doctorate in Governance, also from UCD. Throughout his time in IT Tralee, Gerry has lectured on, and co-ordinated, the Master of Business Programme, and the MBA programme, covering subjects such as strategy, governance and change management. He has supervised a number of research masters’ degrees, presented at conferences and has had articles published in academic journals. 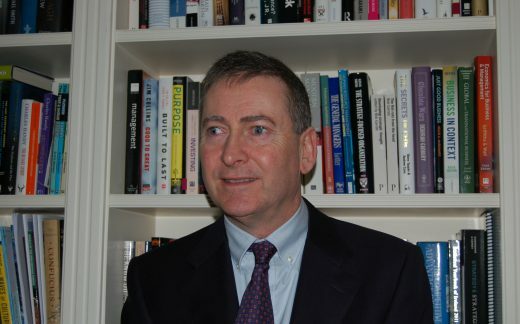 Gerry lectured for 12 Years in corporate strategy for Chartered Accountants Ireland, who also published his text book: Corporate Strategy for Irish Companies, which is used in universities and Institutes across the country. He is currently writing the third edition of the text. Gerry is a former examiner in management for the Institute of Certified Public Accountants. He has also worked on a number of consultancy projects in both the public and private sector. Governance is of particular interest to Gerry, and he considers it to be of prime importance to the success of every organisation. He began his doctoral research in 2011 which in addition to governance, embraced law, economics, political science, the European Union, philosophy, business ethics, corporate culture, and policy implementation. The particular focus of his doctoral research was corporate social responsibility as a mode of governance. Gerry submitted his thesis in September 2016 and successfully completed the viva voce examination shortly after. Since his doctoral graduation, Gerry has continued with research on governance. In response to a growing demand for equipping managers with the skills required to meet the significant challenges in this area, Gerry is currently developing a governance programme in IT Tralee which will be aimed at senior managers across a range of sectors in the south west region.